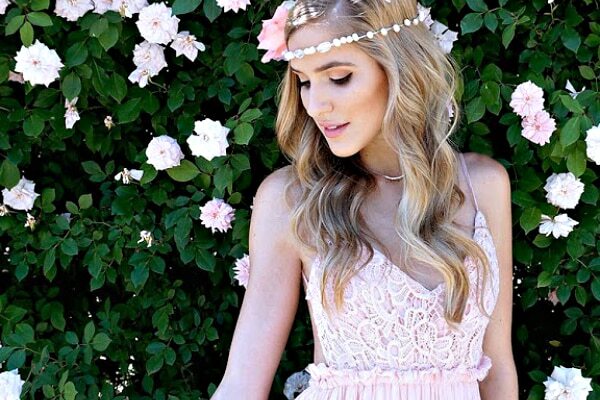 Turns out, it isn’t all about the dress. 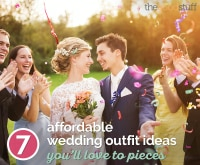 You can make just as much of a statement on your big day with unique and unexpected footwear — and you don’t have to break your budget doing it. 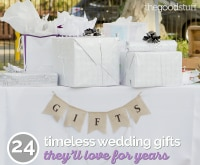 Check out these resourceful and stylish ideas for walking down the aisle in style. 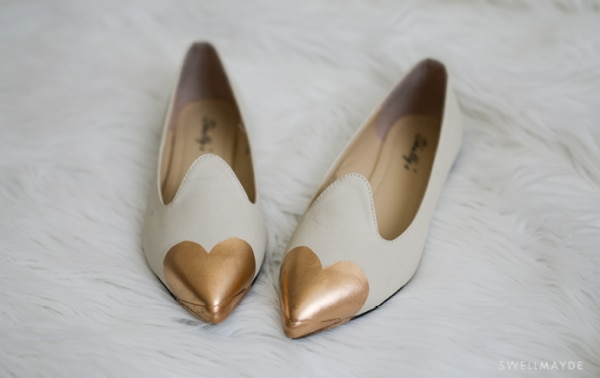 These simple flats are casual, but have enough flair to be worthy of your walk down the aisle. 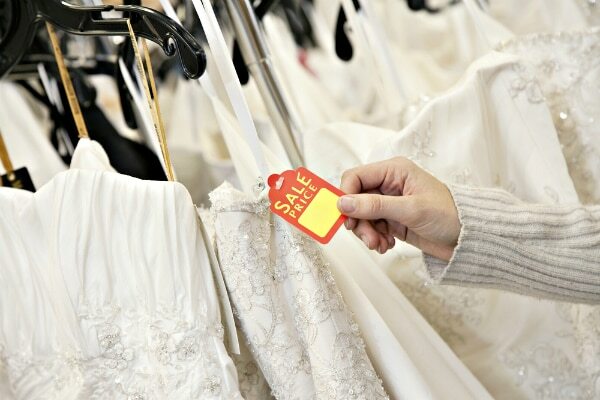 White goes well with any wedding dress, and you can use a golden embroidery thread or match it to your wedding’s theme colors for a bit more pop. You’ll look classy and feel comfy. Pick a spot for your first flower and place a pearl where you’d like the center to be. Use strong glue so there’s no chance your pearl will fall off. Allow the pearl to dry before embroidering. If you’re confident of the layout, you could also adhere all the pearls before you begin embroidering. Cut about 12 inches of embroidery thread (this will give you wiggle room) and tie a knot at one end. Pull it through right next to the pearl and begin making straight stitches radiating out from the pearl. When you’ve completed the flower, tie the floss into stitching on the back/inside of the shoe and pull it through. Trim the remaining thread. 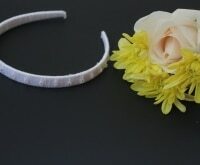 Continue stitching flowers until you have the pattern you like. Repeat for the second shoe. 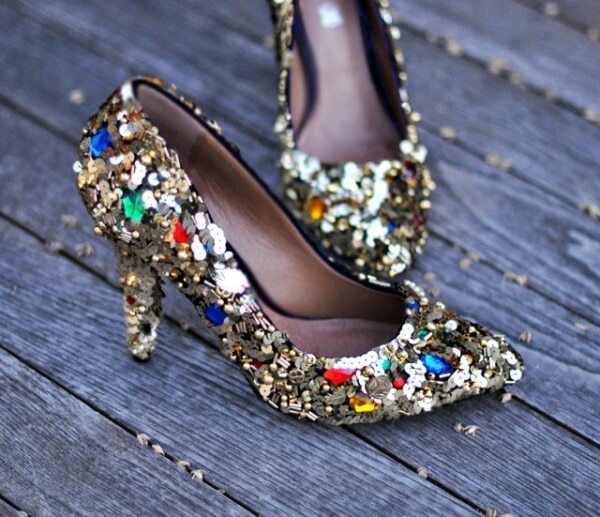 Turn any pair of heels into a shimmering masterpiece with a layer of glitter. Just be sure to seal them thoroughly with a layer of glue so they don’t shed. If you start with a pair that has a metallic toe, leave it exposed for a bit of contrast. 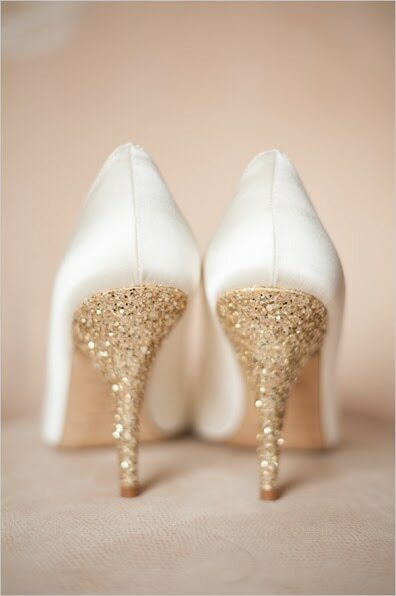 If all-over glitter is too much, do the same process on just the heels for a slightly more subtle pop of shimmer. You’ll get the same wow effect without drawing too much attention to your footwear. Fancify a plain pair of shoes in a matter of minutes by gluing on pieces of lace. You could add detailing to just the back of the heel, or cover the entire shoe for a total transformation. Make your shoes unique and get in your “something blue” at the same time by painting just your soles. No one will even notice until it’s time to kick up your heels and dance. 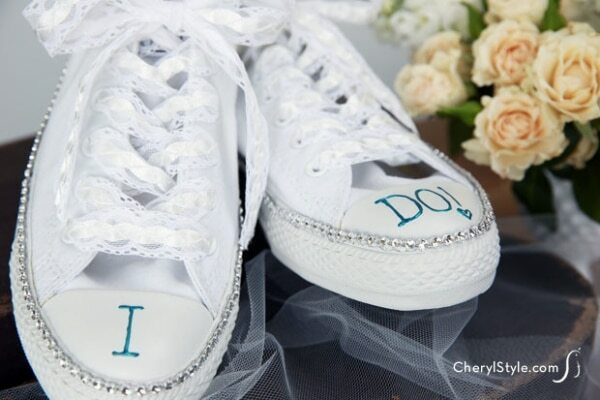 Wear your new name loud and proud on the heel of your wedding sneakers. You can strut down the aisle comfortably or wear these just for the dancing portion of the evening. It’s easy to customize your own at Converse. 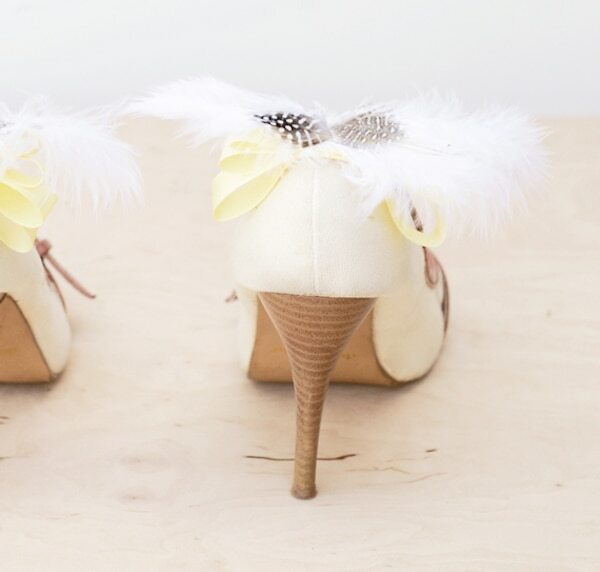 Give plain shoes a little plumage with these easy clips, made out of ribbon and feathers. And since they’re removable, you can reuse them as you like. 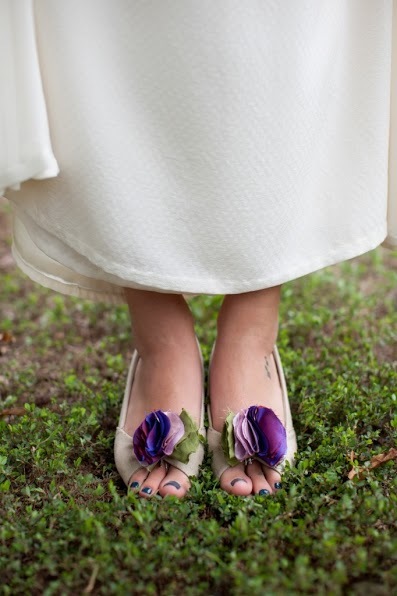 All you need is grosgrain ribbon to transform everyday sandals into footwear fancy enough for your wedding. 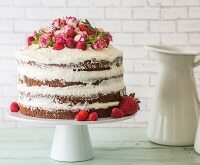 Ivory is classic, but you could go colorful as well. 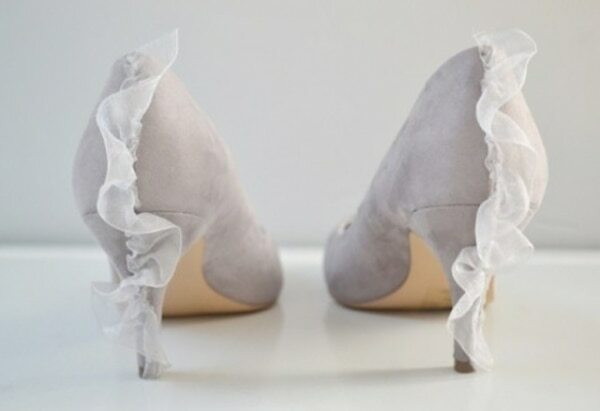 Add a little ruffled detail to the heel of your pumps and they’ll feel right at home next to your gown. All you need is ribbon, glue, and simple sewing skills. 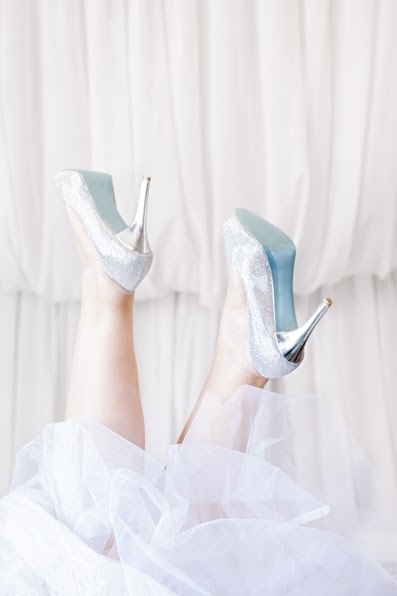 These Figgie Shoes are all the rage, but not very practical for the bride on a budget. 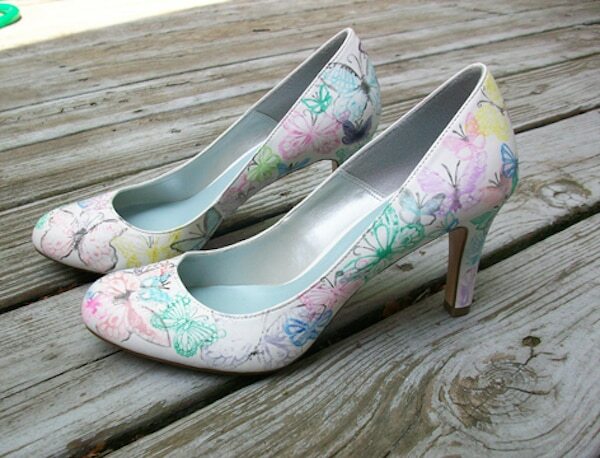 Make your own by painting a plain pair of pumps or drawing with a Sharpie. You can depict motifs that are personally significant to you (names, places, logos, even sports teams!) 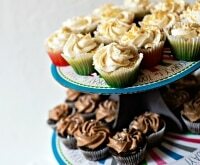 or decorate using random shapes and designs. A simple flower clip can transform an everyday pair of wedges. 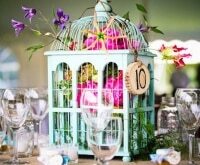 Shades of purple and green matched this bride’s decor, but you could use any shade you like. Make a serious statement with some seriously bedazzled shoes. Start with a layer of lace, then pile on sequins, beads, rhinestones, and whatever else you fancy. 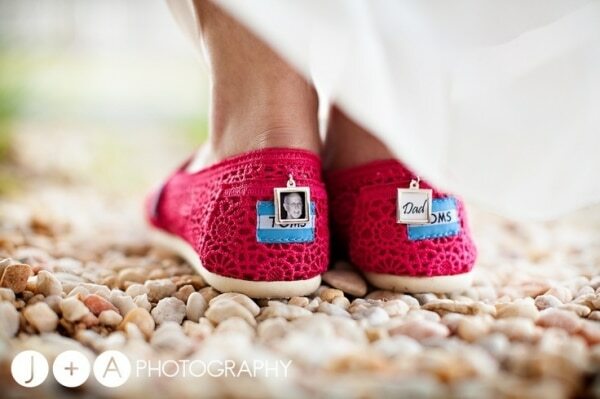 Pay tribute to those unable to be there by wearing them in little charms hung to the back of your shoes. 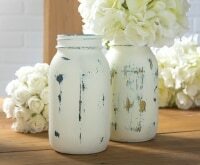 This sweet accessories goes with everything from eyelet red Toms to classic white heels. 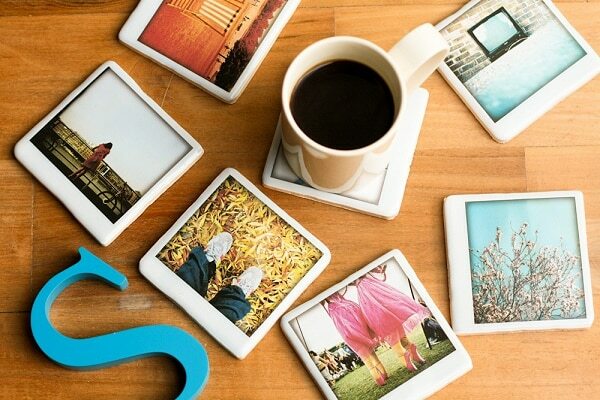 Use charms like these from Amazon to get the look. 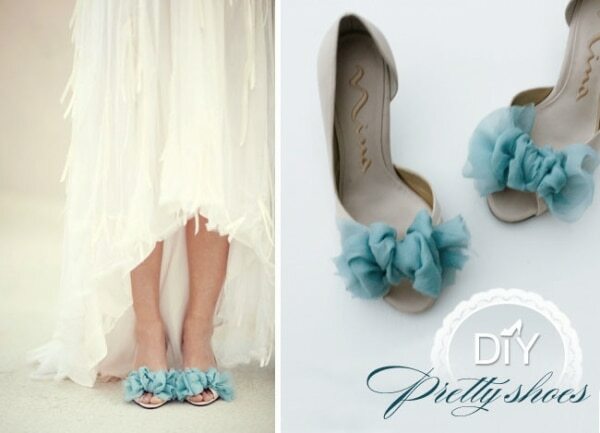 These delicately detailed shoes are a perfectly unique wedding day accessory. Make them with stamps and fabric markers, using butterflies or any motif you like. 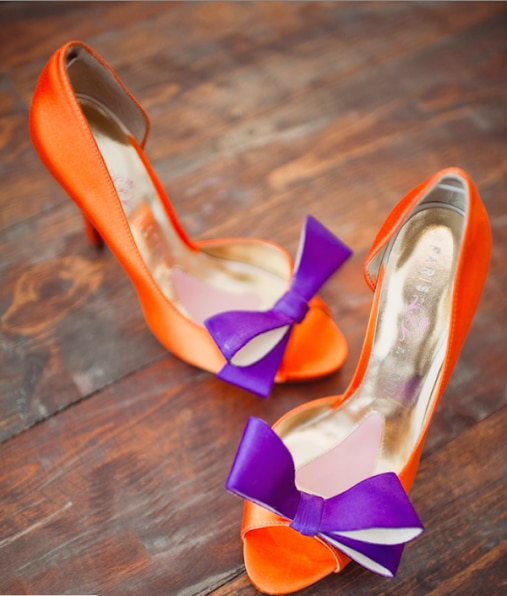 Turn peep toe pumps into something a bit prettier by making bow out of satin-faced ribbon. Rhinestone details add the obligatory bit of bling. 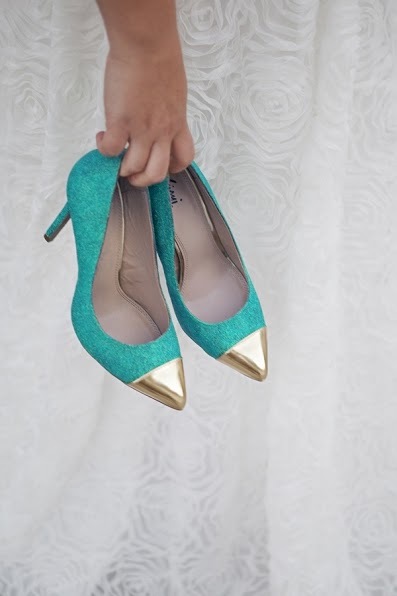 Who knew these classic shoes could be wonderful wedding footwear. Preppy oxfords get a whole new look when you add embellishments like these DIY rhinestone heels. 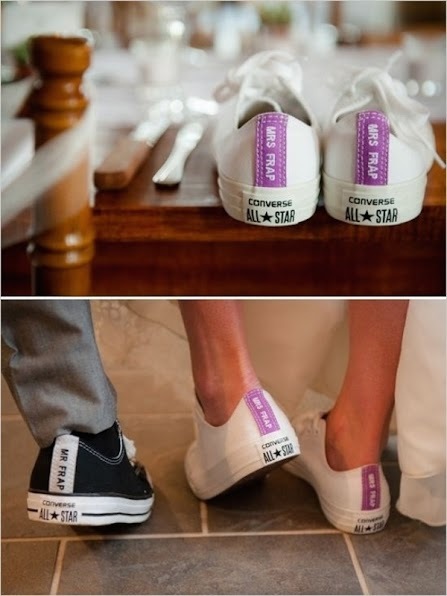 Just in case you get stage fright while saying your vows, write “I do” on your sneakers with puff paint. 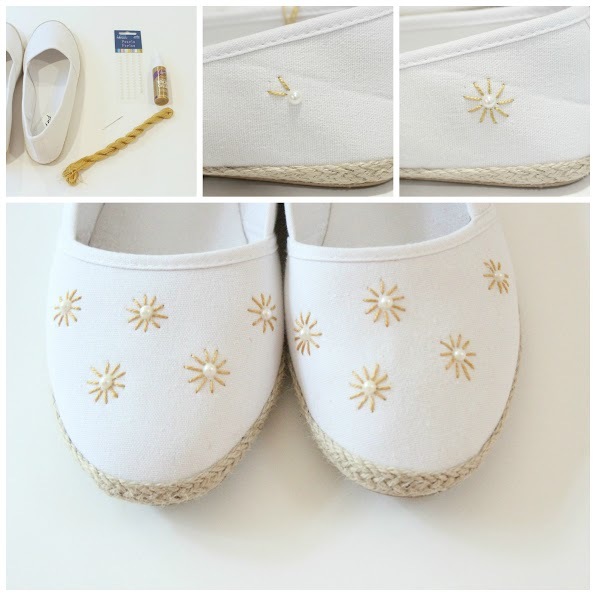 You can also decorate around the top of the sole with rhinestones for extra shimmer. Sometimes the only way to get the perfect shoe hue is to dye it. 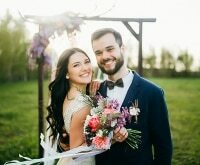 You could do it yourself with the help of this video from VideoJug or send them out to a professional service. Add a contrasting bow for even more pop. A pair of slides are so much prettier when a piece of silk chiffon is tied around the strap. 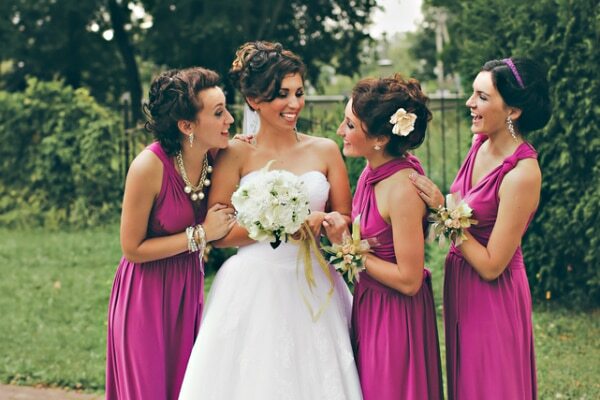 Match the color to your bridesmaids’ dresses, or use silver, gold, or white for a subtler look. 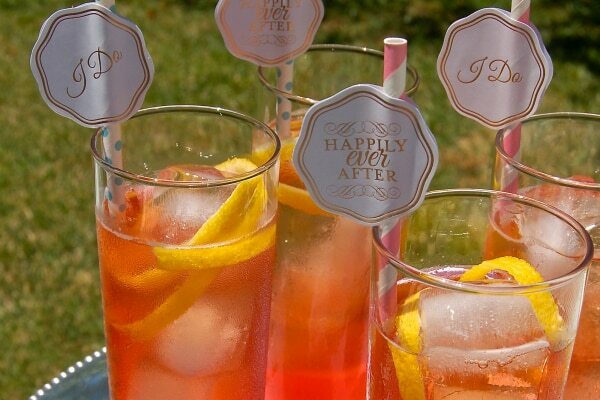 There’s no better motif for the big day. Mark off a heart-shaped toe with sticky paper, then spray paint it with a metallic shade. 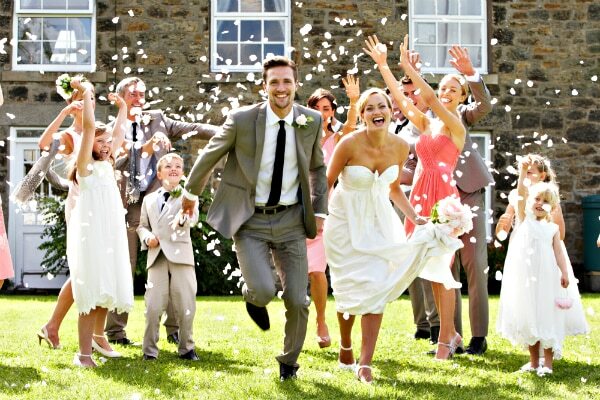 The perfect wedding day outfit includes a fabulous pair of shoes, but they don’t have to cost you a fortune. 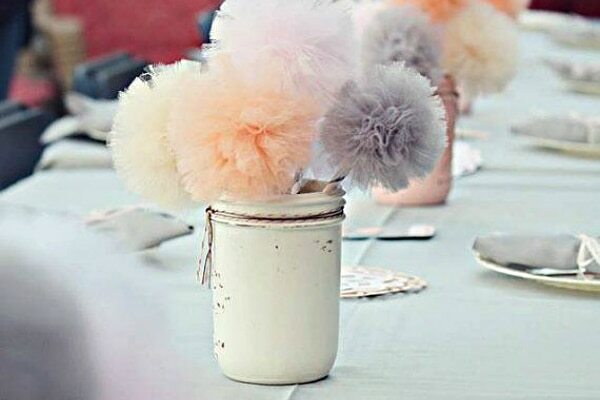 Instead, spend some time personalizing a pair to suit your own style — and even your party decor — using everything from lace to feathers. 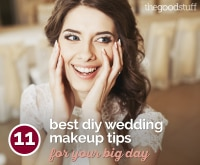 Start with a simple base, whether flats or stilettos, and have fun with the process. 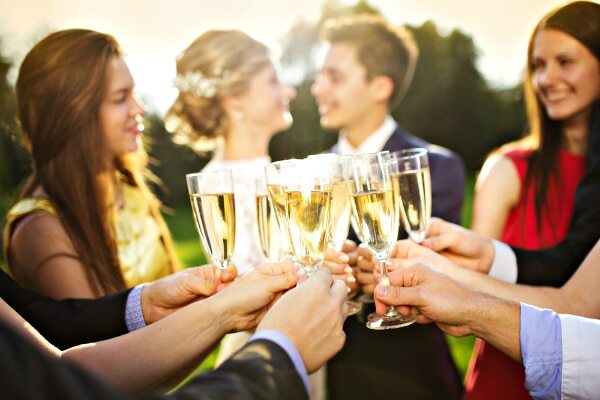 You’ll save money and make memories as you dance the night away! I love this! Another option is gluing on lace appliques. 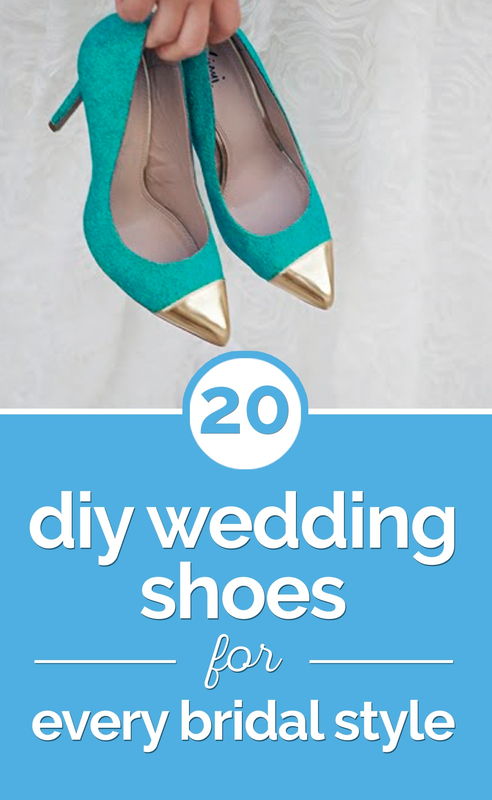 http://www.thecitybee.com/2015/11/diy-wedding-shoes/ Wish I did the glitter ones though. So cute but I’m really messy with glitter.